Chief Lady Bird ​is a Chippewa and Potawatomi artist from Rama First Nation and Moosedeer Point First Nation, who is currently based in Toronto. She graduated from OCAD University in 2015 with a BFA in Drawing and Painting and a minor in Indigenous Visual Culture. 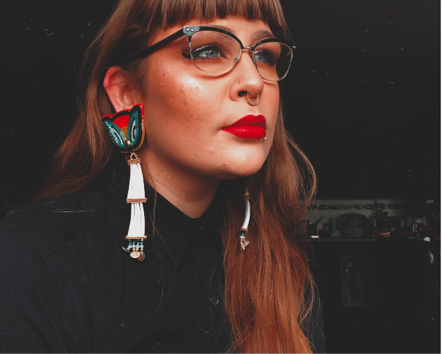 Through her art practice, Chief Lady Bird uses street art, community-based workshops, digital illustration and mixed media work to empower and uplift Indigenous people through the subversion of colonial narratives, ultimately shifting focus to Indigenous Futurisms and creating space to discuss the nuances of our experiences. Chief Lady Bird was the recipient of the Donna Mclean Award for Portraiture and Life Study in 2015; she is known across Turtle Island for her murals and received the Leading Women Building Communities Recognition Award in 2017 alongside Aura. In addition to this, she has created designs/illustrations for Vice News, the Ontario Human Rights Commission, Open Canada, West End Phoenix, Flare Magazine, Chirp Magazine, Indianer Inuit: Das Nordamerika Film Festival, and Oasis Skateboard Factory, to name a few. She was also proudly featured in the legendary Kinship issue of Canadian Art alongside many brilliant Indigenous artists and was the first artist to create an emoji for Twitter for Indigenous Peoples Day/ Indigenous History Month. She has recently illustrated the children’s book Nibi’s Water Song, which will be released by Scholastic Canada in summer 2019!